As your birth Doula I can offer continuity of care and am available to work in the early days and weeks in the post natal period. Antenatal preparation for home & hospital birth. Rebozo for comfort, foetal positioning and more. I have supported Hospital, home and water birth. Induction. Birth after caesarean. Gentle caesarean. I offer Pregnancy & labour massage. Aromatherapy head, hand & foot massage. Baby massage. Breast feeding support. Hypno birthing techniques. Hello my name is Callie, I became a Doula nine years ago my daughter had read an article about the world of Doulas and suggested that I should train, as she felt that other prospective mothers would benefit from my nurturing, supportive and calm presence that I gave her during the births of my grandchildren. Since then I have supportedover 100 clients seeking external help for different reasons. Families today have busy life styles and internal support for the mother to be may not be as readily available. Many women find themselves increasingly isolated from relatives or friends who can play a helpful role during their pregnancies and labour simply due to the time available to the care giver. Often, what a mum wants more than anything else is to talk to someone about her hopes, worries, and expectations, and generally how she is feeling. I have gained much experience over the years mainly with mothers who’s first births left them dissatisfied and disempowered. Fathers who wanted to help support their partners and share in the birthing environment and more. My passion for the work I do is to help make the outcome of a woman’s, and their partner’s journey a positive and memorable one. All labours are unique and even with siblings. A woman can have a totally different birthing experience. I believe women should give birth where they feel most comfortable, I support your choices however you chose to birth, whether it’s a home birth or a medicalised one in hospital. Generally women who have had the benefit of a Doula have said they have had an enhanced experience and/or a quicker birth. 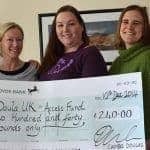 Whilst pregnancy is a miracle, it does present many issues where a Doula can assist where you have to make some important decisions. I provide valuable assistance and help you get the information you need so that your choices become properly informed choices. 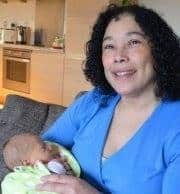 I offer continuous support delivered in a warm, sensitive and caring way, whether you want to give birth naturally, with medication, or are planning a home birth or a C-section. I will help you to relax and feel confident, and assist with labouring and birth positions, whilst offering reassurance and encouregment. I also support father to be, to ensure that he feels needed and confident. I usually meet with the prospective parents in the second or third trimester of pregnancy for us to get to know each other better and to learn about prior birth experiences and/or the history of the current pregnancy. 2015 – The Pelvic Floor Anatomy Function & Rehabilitation Facilitator Alexandra Keating. I hold a child and paediatric first aid certificateand a current CRB.I am fully insured. I regularly attend Home Birth Meetings andoften attend courses, workshops, and training sessions, as I feel it is important to improve on my skills and stay current with related topics. All certificates provided on request. As a birth Doula I have given support to many women and their partners at home, in the Hospital environment and in theatre where there has been no advocate for the birthing woman. I use Aromatherapy massage and pressure points, to help mother to be feel relaxed, calm and confident.I have given support to women by using a variety of skills with various change of positions, comfort measures, movement and breathing techniques. Rebozo which is prevention, facilitating good positioning throughout pregnancy so there is less need for a ‘cure’ at the end of pregnancy or in labour. I offer Aroma Massage in pregnancy and labour. In the postnatal period I have helped women and their families for much needed support and guidance with Breast feeding support. Baby Massage therapy. Breast feeding support. When baby is home I bring a gift of choice from my web site: www.pheroma@etsy.com Please take a look.